Michael Bradley’s 81st minute winner for Roma away to Udinese on Sunday afternoon was an historic moment. It enabled Roma to notch up their ninth consecutive win at the start of a Serie A season. This feat has only been achieved once in Italy, via Juventus in the 2005/06 season, or never before, if you prefer not to see an asterisk when looking at past achievments. With not hours enough in the week I’ll confess to not having seen much of Roma this season but I thought I would see what my numbers can tell us about their wonderful start. A cursory look at the league table will tell us that with just 1 goal conceded in 9 games Rudi Garcia has ensured that Roma has delivered an almost perfect defensive performance. As is our style, we need to go a little further into the numbers to see if the concession of single goal has been deserved or whether they have been the beneficiary of large chunks of good fortune. Roma’s defensive shot chart is impressive. Although the concession of 107 shots (excluding penalties) is good, it places them in just 4th place in terms of the fewest amount of shots allowed in Serie A. Juventus top the table with a really stingy total of just 70 shots given up during their first 9 games; Sampdoria and Inter complete the teams that have conceded fewer shots than the league leaders. 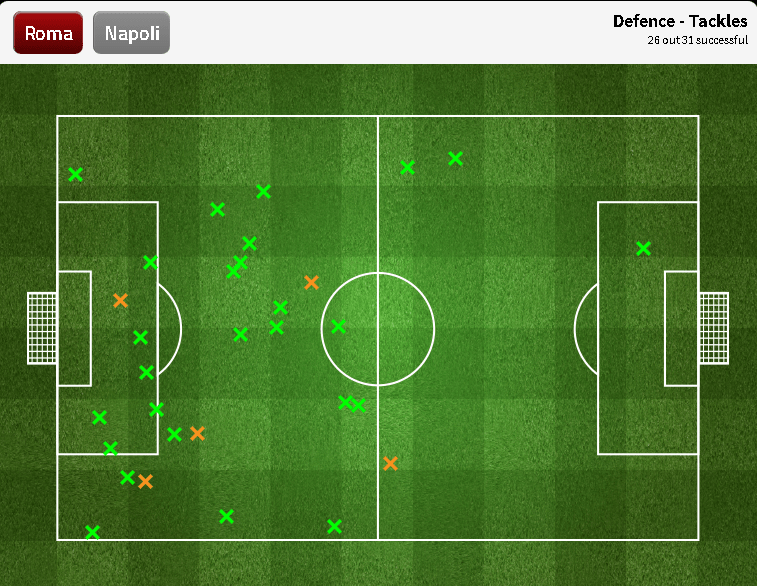 Roma’s defensive strength has been in the way that they have forced the opposition to take long range shots. 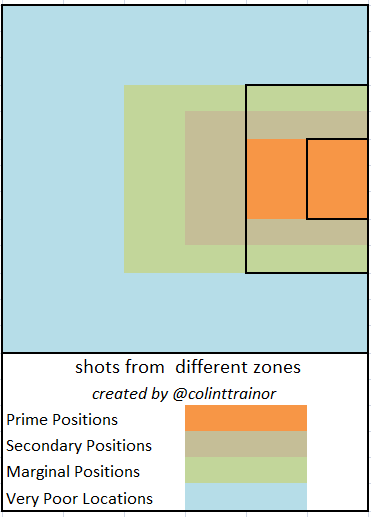 Only 21% of shots against them have come from the Prime Zone (defined below); this figure is the lowest in the league. Their staunch defending around the areas of the penalty area can be further seen by the fact that by allowing just 27% of their shots conceded to be hit from the Secondary zone, they ensure that a massive 51% (roundings) of shots targeted at Morgan De Sanctis originated from the two outside zones. Inter trail a long way behind in second place in this metric at 41%. So, in terms of defensive shooting zones Roma have been superb. In fact, so good have they been at preventing teams from taking shots at goals from favourable positions that they have the lowest average ExpG value per shot conceded in the Big 5 leagues this season. To expand a little on ExpG for those unfamiliar with the concept, we assign a probability of each shot being scored. This probability is determined with reference to all of the information that we have about a shot; the information is obtained from Squawka and StatsZone. There’s obviously something special going on with this team in terms of defence. This can be seen in the chart below which plots the average ExpG values for the teams across all Big 5 leagues that have have had the lowest average ExpG values for the shots they have conceded. Not only do Roma lead this measure, which is quite a feat in itself, but the difference they have over the other leading teams is clear to see. Even with removing the scale on the y axis, we can see how closely bunched the teams that follow behind Roma are on this measure. This is always a really good indicator of a team that is head and shoulders clear of the chasing pack. Other than the shooting opportunities they give up, if I was to point out one other facet of the defensive play that they have excelled it, it would be their ability to block shots. Roma have blocked 41% of all shots they have allowed. Only one other team in Italy has blocked more than 30% of the opposition shots, Catania at a clip of 32%. This large amount of blocked shots leads to an interesting anomaly. De Sanctis, as the Roma goalkeeper, has saved just 17% of shots taken. Unbelievably, with just 18 saves he has actually had the fewest number of saves in Italy. That is certainly not what you’d expect the goalkeeping stats of the team that has just conceded 1 goal in 9 games to look like. It may be as a result of the fact that they have spent huge amounts of time in leading game states, but Roma’s defensive style has certainly been one of keeping it tight and compact at the back. They do not press high up the pitch at all, they are content to let the opposition have the ball in non-threatening positions and reorganise themselves in their own half. 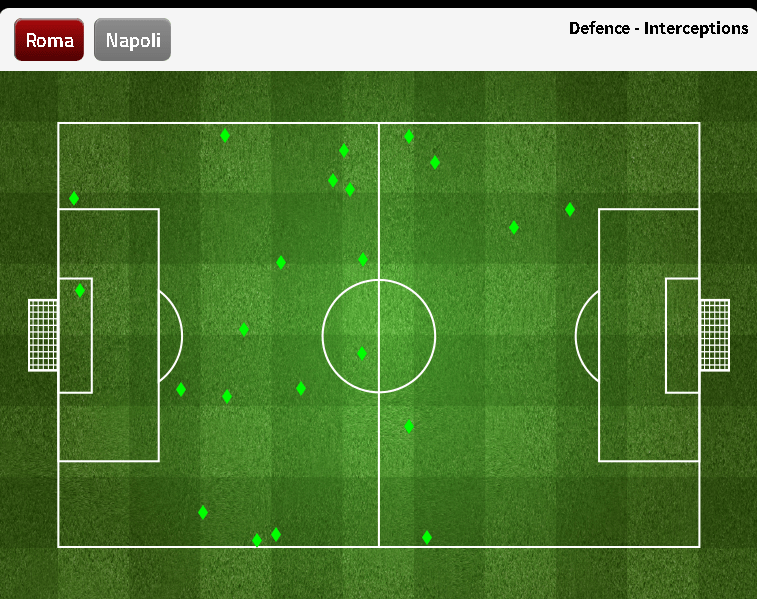 Here follows the defensive actions (tackles, interceptions and fouls) carried out by Roma in their last home game, against Napoli. 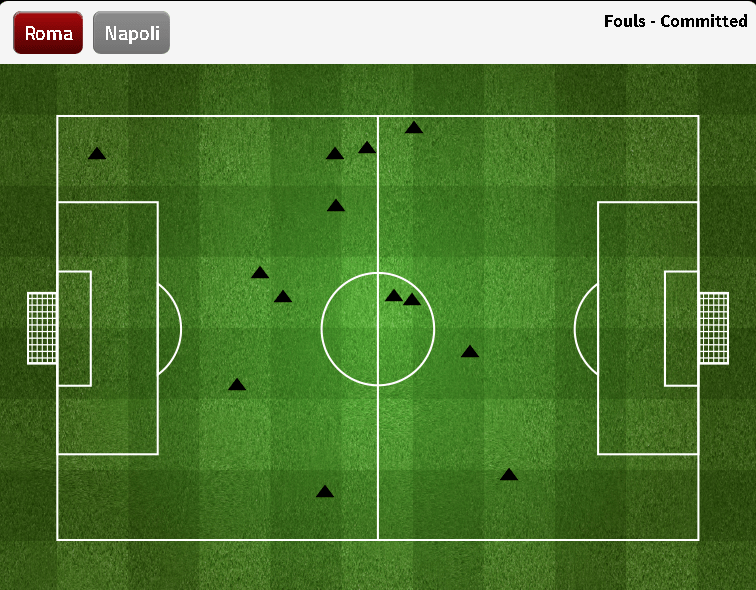 During this game Roma only had 4 defensive actions (1 foul, 2 interceptions and 1 tackle) in their attacking third. This game was by no means a one off in this regard as they consistently have amongst the fewest defensive actions at the top end of the pitch in Serie A. The proviso here is that we wouldn’t expect a team that has led for so many minutes to do much pressing. However, I think this lack of pressing is important as it partly explains why they have been able to block so many of their shots faced this season. However, even with the exceptionally low average ExpG defensive values that they have posted, they have still massively over performed in allowing just 1 goal to be conceded. 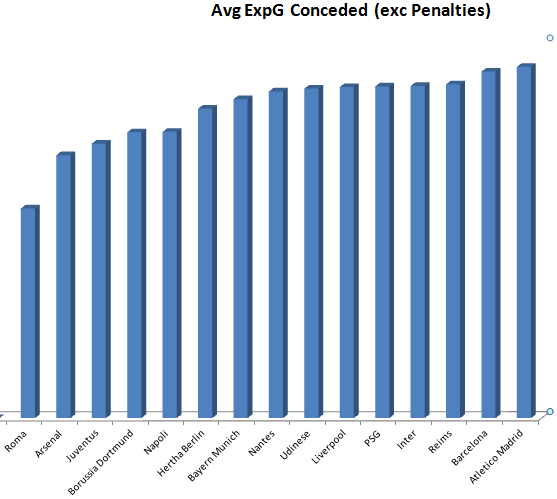 Based on the objective ExpG calculations Roma would have been expected to have conceded a few more goals on top of that. Given that their goals against tally currently stands at 1 it’s not the bravest call in the world to suggest that they will see some regression in the near future. But all I can say, is that they will…….. 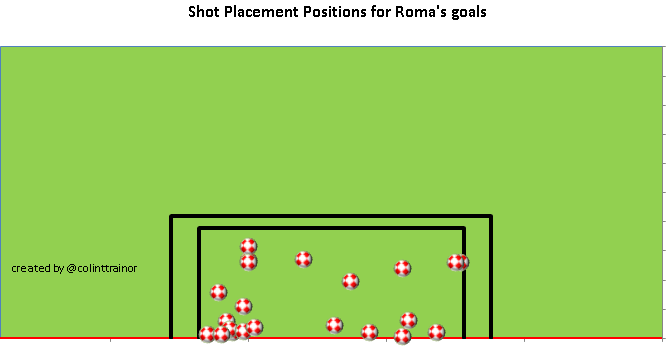 The above image shows the location, as well as the outcome for each shot that Roma has conceded. Apart from the sheer volume of dots outside the penalty area what is striking is the 7 blue shots that have been taken from central locations in an around the edge of the 6 yard box. The fact that they are coloured blue means that they missed the target. The wayward placing of what should be great shooting opportunities for goal scoring from those shots will go a little towards explaining why their concession of just 1 goal is much less than they “should” have conceded. For what it’s worth, according to our ExpG values Juventus should have conceded fewer goals than Roma. Yet the Turin giants have conceded 9 (excluding penalties) to AS Roma’s 1. Make of that what you wish. I’ll make just one final comment on the ExpG values of the shots they have conceded. As I have stated in all similar articles, our ExpG values do not take account of defensive pressure. The data that is currently displayed by the likes of Sqauwka and StatsZone do not include any defensive information at all. The data does not know whether there were any defenders pressuring the striker as he took the shot or whether the defensive team had a significant number of defenders back. As Roma have blocked such a high proportion of the shots they have faced, perhaps the defensive pressure they are exerting on shots they allow is higher than average. If this is the case then the ExpG values that we assign to the shots they conceded may well be over-estimated as our model is not capturing exactly how any given team defends. For me, Roma aren’t nearly as interesting going forward as they are in terms of trying to understand how they defend. With just 22% of Roma’s shots being hit from Prime Locations they actually have the second lowest proportion of shots from this optimum location in Serie A; Livorno are the only team worse than Roma on this measure. This fact certainly isn’t what we’d expect to see of a team that is top of the table. They have slightly more shots (excluding penalties) than average with 130 against the league average of 119, and this mix of shot quantity with their shot quality results in a forecast position of 9th in the league in terms of ExpG scored. Yes, in terms of the number of goals scored there should have been 8 teams that scored more goals than them, but there has only been one that has actually done this. It will therefore come as no surprise for me to say that through scoring 18 goals from non-penalty situations they have comfortably exceeded the amount of goals that our model had expected them to score. The majority of Roma’s over performance can be attributed to their long range shooting. 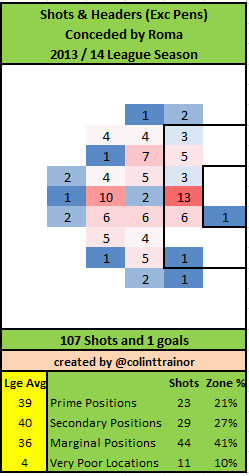 Their total of 6 goals from outside the penalty area is a league best total (jointly held with Napoli), this compares with a total ExpG value per our model for these shots of 2 goals. Perhaps their style of play; compact defensive shape and then quick transitions to counter attacking football, means that due to the relative lack of defensive pressure the quality of the chances they create are better than our model gives them credit for. However, even bearing this in mind I’d be strongly of the opinion that their goals scored tally of 18 (excluding penalties) makes them look much better than their bare numbers would suggest from an attacking point of view. At this early stage of football analystics, not enough work has been done to be able to conclude whether a team or a player can, in general terms, repeat good shot placements. Personally, I think it is reasonable to accept that the very best strikers demonstrate a specific skill which allows them to pick out great shot placements. However, on a team level I’d need some persuasive evidence to suggest that this phenomenon exists. 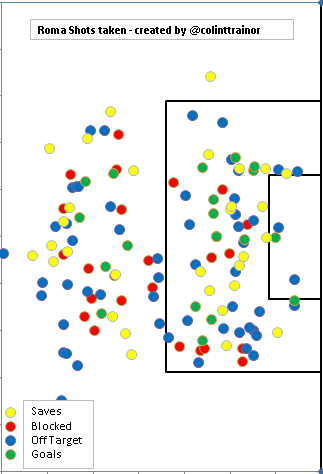 The above Shot Placement chart suggests that Roma have been very effective at picking out spots that goalkeepers find it difficult to save from. I think this goes a little to explain why their conversion rate is 14%, which is second highest in the league. This is conversion rate is even more astounding when you consider that they have had the second fewest proportion of their shots from Prime shooting locations. The question is whether they can continue to be as efficient with their shot placements given the distances that they have tended to shoot from. They are doing something very special in defence. The quality of the average chance they concede is the lowest in the Big 5 leagues. That is a serious accolade to have on your mantelpiece. With a blocked shots percentage of 41% they get a huge amount of bodies back when defending which constricts the space available to opposition forwards. But even with these terrific defensive traits they have still over performed significantly in defence to have conceded just one goal. 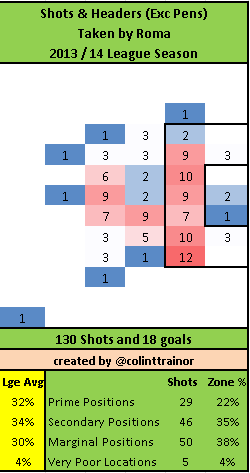 Given the amount of shots they concede their goals against tally will start to increase. Going forward they appear to be average, with a slightly higher than average volume of shots being offset by generally poor shooting choices. They seem to have led a charmed life with the number of goals they have scored, especially from long distance shots. I’ll be hugely surprised if this continues.